According to the Census of Population and Housing conducted in August 2011, there were 45,846 people employed in selected audiovisual industries1. Of these, 53 per cent were men and 47 per cent were women. Data for some industry categories dates back to 1971; however, employment in the video hire industry was included in 1996 for the first time. 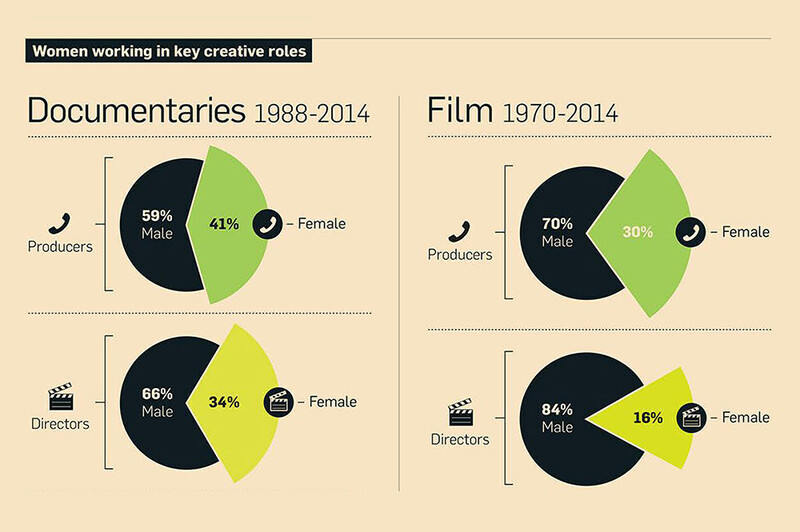 Since then, the proportion of men and women working in the audiovisual industries has remained relatively steady, with the number of men growing at a slightly faster rate than women (increasing by 15 per cent compared to 11 per cent). Adjustments have been made to figures by the ABS to avoid the release of confidential data. According to the Census of Population and Housing conducted in August 2011, there were 9,908 people employed in film and video production and post-production services1. Of these, 65 per cent were men and 35 per cent were women. Since 1971, the proportion of men and women working in the industry has remained steady, with the number of men growing at a marginally faster rate than women (increasing by 564 per cent compared to 543 per cent). Source: Compiled by Screen Australia using unpublished data from the Australian Bureau of Statistics (ABS), Censuses of Population and Housing, 1971–2011. According to the Census of Population and Housing conducted in August 2011, there were 657 people employed in film and video distribution1. Of these, 44 per cent were men and 56 per cent were women. Since 1971, the proportion of women working in the industry has remained relatively unchanged, with only a 2 per cent decrease, while the proportion of men has fallen by 33 per cent. According to the Census of Population and Housing conducted in August 2011, there were 9,871 people employed in the film exhibition1 industry. Of these, 48 per cent were men and 52 per cent were women. Since 1971, the proportion of men and women working in the industry has remained steady, with the number of men growing at a faster rate than women (increasing by 122 per cent compared to 96 per cent). According to the Census of Population and Housing conducted in August 2011 there were 17,296 people employed in the television broadcasting1 industry. Of these, 56 per cent were men and 44 per cent were women. Since 1971, the proportion of women working in the industry has increased from 28 to 44 per cent, and the number of women has grown by 421 per cent. According to the Census of Population and Housing conducted in August 2011, there were 7,552 people employed in the video hire1 industry. Of these, 39 per cent were men and 61 per cent were women. Since data became available in 1996, the proportion of men and women working in the industry has remained steady. Since 2006, there has been a large decline in the numbers of men (down 18 per cent) and women (down 28 per cent) working in the video hire industry.